Italy: An extra-time goal from Mirko Vucinic was enough to take Juventus through to the Coppa Italia final after a pulsating 2-2 draw with AC Milan at Juventus Stadium on Tuesday. Holding a 2-1 lead from the first leg, the Turin giants were boosted by an Alessandro Del Piero goal in the first half, but goals after the break from Djamel Mesbah and Maxi Lopez subjected the Bianconeri to their first defeat of 90 minutes this season and took the tie into extra-time. Vucinic stepped up though to score a sumptuous goal to send the Old Lady to the final. With the Bianconeri holding all the cards going into the game, it was the Rossoneri who started the brighter of the two sides. Milan were completely dominating possession in the early stages, and perhaps should have made Antonio Conte's side pay on 20 minutes. Zlatan Ibrahimovic turned past Andrea Pirlo on the edge of the Juventus area, and, opening up his body, sent a shot goalwards, only to see Marco Storari push it wide of his left-hand post. Seedorf had a long-range effort that went just a whisker over the bar midway through the half, but on 27 minutes Milan were cursing their wastefulness as the hosts opening the scoring. A superb run from Stephan Lichtsteiner down the right-hand side culminated in a low cross towards Del Piero, who flicked the ball over the on-rushing Marco Amelia, and coolly tapped it into the net. Milan were still dominating the play – ending the half with just under 60 per cent of the possession – but it was Juve who had the best chance just before the break. Mirko Vucinic was played through by Arturo Vidal, but delayed his cross for too long, and the eventual ball to Emanuele Giaccherini was slightly too high as he headed wide. The sides returned for the second period, and almost immediately a deep searching through ball from Philippe Mexes alluded all the Juventus defenders inside the area and reached the far post, where Mesbah finished brilliantly with a diving header into the top right-hand corner of the net. With the scoreline on the night level, the wind was really in the Rossoneri's sails, and they perhaps should have added a second goal just 15 minutes later. A deep cross from the right by Luca Antonini found Sulley Muntari at the back post, but he couldn't quite bundle the ball home under pressure from Leonardo Bonucci. The wave-after-wave of Milan attacks eventually paid dividends though on 81 minutes. Maxi Lopez received the ball just outside the area, turned Chiellini, and smashed it into the top right-hand corner past Storari. Juventus substitute, and former Milan striker, Marco Borriello, had the best opportunity to avoid extra-time just moments later. Played through by Giaccherini, the Italian forward found himself one-on-one with Amelia, but he could only hit his effort straight at the keeper, and with that, the teams went into the added 30 minutes. Extra-time began with exactly the same frenetic tempo as the game itself, and within minutes, Juventus had two great chances to score. 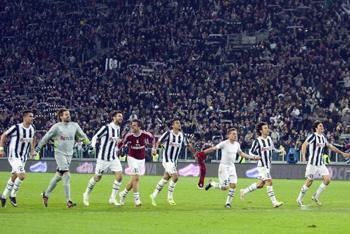 Firstly, a cross from the right found Claudio Marchisio, but he blazed over. And secondly, Vucinic played Giaccherini clean through on goal, but the former Cesena man, deciding to go around Amelia, had the ball taken from under his feet by the keeper. But midway through the first period, all of that was forgotten as Vucinic struck a beautiful effort from 30 yards into the top right-hand corner of the net to give the Bianconeri a 4-3 aggregate lead going into half-time. The second period quickly turned into a scrappy midfield battle, with lots of late, niggling challenges. And despite a late charge from Milan, the referee blew for full-time to take Juventus through to their first cup final since 2004.